Do you have a great idea for a mobile app? Does your business website need a modernized design? Is it time to upgrade your information systems? Outsourcing your web, app and software design and development is an efficient way to get work done on budget and within a deadline. Utilize the expertise of these 10 awesome developers in the Philippines for affordable web design and get your projects finished with finesse. Read on to discover their qualifications, services, and track records. 7th Media is a full-production digital development and production company based in the Philippines. They create mobile apps, websites, animations and Facebook apps, among others. 7th Media combines beauty and functionality in everything they create, integrating design, technology and strategy to achieve outstanding results. They have revolutionized websites for Fortune 500 companies, ad agencies, and boutique agencies in New York, Los Angeles, Sydney, Singapore and the Philippines. Starfish provides stunning website designs and easy-to-use management and marketing tools that have been developed in-house to fit your specific needs, without all the extra pomp and circumstance. They believe that having a great website and tools should be available and affordable for small businesses, not just wealthy international corporations. They have created websites for cities, non-profits, restaurants, phone companies and construction companies from around the world. MicroSourcing was founded in 2006 and has a team of internationally experienced software and website developers. They offer web and software development services and can provide companies with their very own teams of dedicated programmers, marketers and project managers. According to their website, they have served 145 companies ranging from one employee to 500. Arcanys is a Swiss company with offices in Cebu, Philippines. Although Arcanys has Swiss management and implements Swiss best practices, they are based in Cebu for the quickly developing pool of IT and customer care professionals. The company was founded by entrepreneurs with more than 10 years of experience ranging from online sales, online marketing, SEO, web design, database design, mobile applications and supply chain management. After deciding to move all operations to the Philippines, the shareholders have worked to build solid and talented teams for all departments, enabling Arcanys to support other Western businesses that benefit from hiring team members overseas. They have successfully launched numerous brands and e-commerce websites. FYDesigns is a web design company in the Philippines that offers quality, affordable and timely implementations of websites. They serve businesses ranging from startups to large-scale enterprises and are focused on leveraging motivated and passionate professionals to help your online business growth. Their teams also go beyond the launch of a new website by providing support and teaching clients how to optimize their sites to full potential. FYDesigns can help you with anything from web development to online marketing. Webdesignphils.com (LongHead Digital Solutions) is a team of diverse professionals in IT, the creative arts, and marketing. They believe in the power of ideas, executed by a talented workforce, and molded with strategy. They harness their creative talent to produce persuasive, powerful and effective concepts. Their mission is to provide the highest quality of web services demanded by most industrialized nations. They envision achieving this by fostering their teams with continuous learning and development, achieving growth by satisfying their customers, and promoting the Philippines as one of the top alternatives for web design and web application development. Marvill Web Development was founded in 2009 out of a vision to provide quality IT solutions through media and web development. They are committed to providing complete web development services, from the creation of ad materials like logo design, up until web maintenance. They offer fresh concepts to breathe new life into your brand, designs that will get your message across seamlessly, and the skills to build your website while harmonizing functionality and design. Pixelworks has almost 30 years of experience building websites and won the Philippine Web Awards in both 1997 and 2011. They create small business websites, e-commerce websites, and content management systems. Pixelworks designs websites from scratch, so you can be sure every aspect of the site fits your company brand. They can also add content management systems so it’s easy to update images and text to keep your site current. Dynamic Objx is a software development company based in Manila, Philippines. They specialize in SAAS products, software development outsourcing, custom software development, and web and mobile applications. They are an affordable option for building websites and other tools for your business, and they utilize open-source framework and the best creative and technical minds to make it happen. Dynamic Objx also uses agile software development methods and practices such as scrum, extreme programming, continuous integration, and more. Carl Ocab started his career at age 12, when he first started blogging and building websites. He launched CarlOcab.com at age 13, earning the title “kidblogger.” Now with ten years of experience, the agency provides internet marketing services to business customers ranging from the tech to financial to landscaping industries. They even offer a free mockup option, so that new clients can see what their web presence could look like with no obligation. 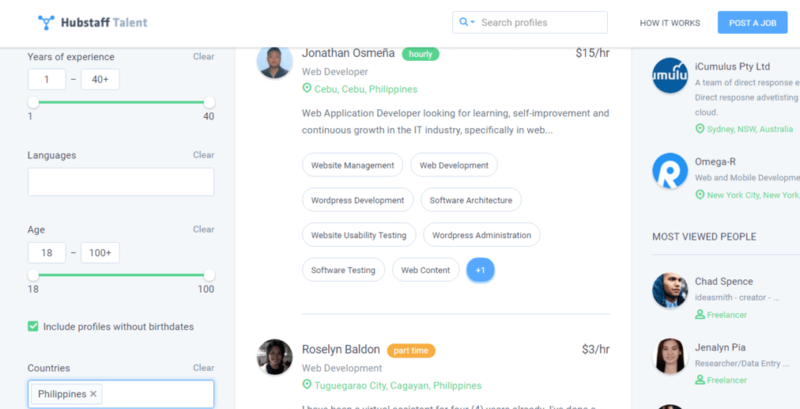 Hubstaff Talent connects web developers and clients with efficiency and finesse. It’s a free directory for companies looking for remote talent across the globe. There are no markups and no fees on either side (freelancer or business owner). That means web developers get exactly what their client pays them. Search through 4000+ web developers and web development agencies or get bids on your job. This free platform displays a web developer’s hourly rate, skills, experience, availability, resume, and languages spoken. Web developers also have the option to add a short “about” description to provide more information on themselves. Profiles can be filtered by skill, availability, years of experience, or country. You can also run a search for keywords or phrases.